Snap up the latest GPU in Nvidia's stellar family of pedigree gaming cards—and for a steal. Nvidia's GeForce GTX 1660 recently emerged as a very affordable and very competent latest addition to Nvidia's family of Turing architecture GPUs. It has the potential to sneak into best graphics cards for gaming lists given its offerings of performance on a (relative) shoestring, particularly if you're building a new rig from the ground up. Building on all that makes the 10-series, and 20-series to a degree, good, but making moves to then strip back and simplify, the GTX 1660 is a graphics cards that balances price and performance, producing a mainstream, accessible and attractive card. Utilizing GDDR5 instead of GDDR6 and with fewer CUDA cores, the 1660 sacrifices a little to obtain that 'affordable but capable' GPU mantle. However, such trade-offs (for lack of a better phrase), leading to a good level of performance for a competitive price, have resulted in there being plenty of questions raised over how different the 1660 actually is from its nearest, previous generation counterpart. It's a close-ish thing between the 1660 and 1060 but the architectural enhancements, higher clockspeeds, and greater number of shader cores the 1660 has means it is a clear enough victor. It's definitely going to appeal more to those building a new machine (on a medium to modest budget) rather than those looking for an upgrade, given its capabilities, though it will probably be a little while before we see amazingly low prices for those wishing to take a punt on it. But, this is the best place to find a deal for a 1660 right now. To check out some alternatives and competing cards within Nvidia's range, check out the best Nvidia GTX 1080 deals and the best Nvidia RTX 2060 prices to ensure your bases are covered. Asus has a decent range of options for the latest entry into the GPU market, from 'simple' single fan options to ROG Strix three-fan beasts. (Though the latter are usually in the Ti range and cost a bit more.) Of the straight up 1660 series, the pick of the bunch is arguably the overclocked TUF Gaming edition that has dual fans and an 1845MHz GPU boost clock. 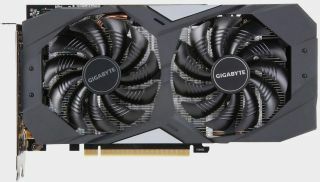 Offering a surprisingly wide range of eight models across the 1660 range, Gigabyte has an overclocked version for every 'normal' version of the GPU. The eminently affordable overclocked OC 6G card is attractive as this factory overclocked card kicks the boost clock up from 1,785MHz to 1,830MHz for better performance and a custom dual-fan 'Windforce' cooling solution keeps temperatures in check. Some familiar model types appear in MSI's range with words like Aero, Armor, and Ventus getting thrown about on different cards—each variant having an overclocked version to plump for if you so wish, that reach 1830 or 1845MHz boost clock speeds. Some models have an active overclocking utility that identifies and maintains the highest stable overclock settings. Like other card makers EVGA, gooses the boost clock on its 1660 models from 1,785MHz (stock) going up to 1845MHz on its Ultra variant. The XC Black Gaming version has a single fan, which allows for a shorter profile compared to Gigabyte's card (7.48 inches versus 8.82 inches), though it's also a triple-slot width. The Ti version of the same card will provide the biggest boost in terms of performance with memory speed bouncing up to around 12Gbps. Palit's 1660 cards come with some fun LED lighting on them as a nice aesthetic touch, and across single- and dual-fan models. In terms of cold, hard numbers they reach the same levels as the above makers, but their accessible and aggressive pricing makes them an attractive budget option for sure. Zotac's cards, despite being dual-fans, are all super compact and can offer similar performance to other cards while not needing much PC space. The AMP Ti card will give you the biggest bang for your money though, with it being comfortably boosted to more than 1800MHz clock speed, with 12Gbps GDDR6.